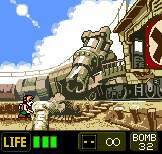 Hot on the heels of the great Metal Slug 1st Mission, comes the "imaginatively" titled sequel. I loved the first game, which was great fun, so I was really hyped up about getting this. I couldn't imagine that SNK would make it anything less than great, and thankfully it IS great! Although the name is unimaginative, the game certainly isn't. 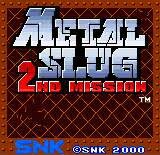 SNK could have easily just thrown together a sequel with a few new levels and some new weapons and called it �2nd Mission�, however they have actually added some pretty cool features, which give the game some extra replay value. 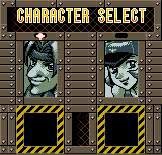 The first noticeable difference is that you get to choose to play as a male or a female character. This option was available before, but only after you had completed the game once. You also play through different stages depending on which character you picked. 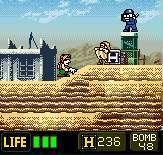 In addition to that, remember the hostages that you have to rescue in all the other Metal Slug games? Usually rescuing them gives you an extra weapon or bonus and also a few points, but nothing else. In this version, you now get a list of the soldiers that you have rescued, so you can collect them (dare I say it) Pokemon style. Each of these hostages gives you various hints/tips to help you on your way, but only if you have gained a high enough rank� your rank is increased by collecting more of them. This is sort of like the �puzzle pieces in Sonic Pocket Adventure, so even after you have completed a level you will still want to play through it again so that you can explore and find everything. I do find it a little funny that all of the soldiers look alike while in game (bearded men), but when you look at their pictures on the list some of them are women! There are some other good new features too. Visiting the options screen lets you access a time attack mode. As you get promoted through the ranks, more time attack stages become open to you and some of these include stages from the first game. They are also quite tricky, as you don't have an energy bar, so you only have to be hit once to die. The other main improvement is that there are now three vehicles to control, the tank, the plane and also a new submarine, which is pretty cool. 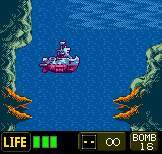 The submarine can fire upwards and forwards, plus if you surface, you can also fire homing missiles at enemies not in the water, which is a nice touch. In 1st Mission, when you were controlling the tank, if it was destroyed you were sent straight to the prison camp level. In this game, you just jump out of the tank and carry on fighting on foot, which is more like the arcade version of the game! This doesn't mean that they have completely gotten rid of all the cool missions that you go onto when your vehicle is destroyed though. If you are controlling the plane and get shot down, you now have to use a jetpack (which has a limited fuel supply) to make your way back down to the ground (instead of the parachute from the first game). If you are in the sub, you get into a small boat and have to hammer the �A� button to row back to shore (while avoiding mines). The best part about these levels is that they make you take a different route through the game than if you had completed it normally. When you exit the options screen on the main menu, it shows you a list of the areas you have completed � there's 38 levels altogether, so it will take you a long time to see everything! As expected, the graphics are very good for this handheld system. 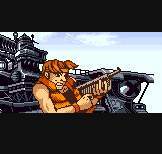 The first NGPC Metal Slug was affected by some slowdown and I expected it to be the same with this game� but it isn't! There is actually a lot less slowdown than before, in fact the only real place that it does slowdown is when a digital sound (a little speech when you collect a weapon) is played. The speech is pretty good; although it's annoying that it slows the game down. If you would rather keep the game running full speed and make do without it, you can turn it off at the menu. Ignoring that problem, the graphics are impressive and there are some great little touches including nice parallax scrolling, flocks of birds flying past on the jetpack level and also a part where some civilians run past you, trying to get away from the Terrain Carrier. The large Terrain Carrier boss is also very well done and looks quite detailed, as do many of the bosses. Everything is beautifully presented too, with some nice intro screens, good menus and also some radio chatter between characters after each level which furthers the story, making it feel a little bit more in depth than MS1. Other than the graphics and the decent (for a handheld) speech, the sound quality is good, although most of the music is copied from MS1. Fans of the first NGPC Metal Slug game will love this game even more than the first and will stay addicted to it for a very long time, due to the variety of stages and the extra challenges that you can go back and do even after completing the game. If you haven't played either of them yet, then I suggest you give them BOTH a try now as I doubt you will be disappointed with them. I don't think you will find a better platform shoot �em up on any other handheld system. The prequel, still a good game though!